How popular is the baby name Alyssa in the United States right now? How popular was it historically? Find out using the graph below! Plus, check out all the blog posts that mention the name Alyssa. The ratio of Biblical names to non-Biblical names in the girl’s top 20 is about the same today as it was 100 years ago, though the ratio did change a bit mid-century. 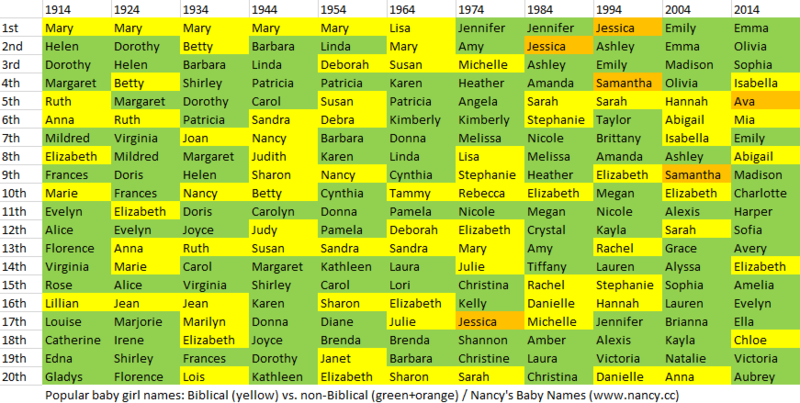 Popular girl names over time: Biblical (yellow) vs. non-Biblical. Click to enlarge. Again, feels pretty weird to put overtly Christian names like Christina and Christine in the non-Biblical category, but oh well. Just like with the boy names, though, there’s a big difference between the 1914 and 2014 sample sizes — 31% and 12%. So let’s also look at the 2014 top 100, which covers 31% of female births. Faith, Grace, Angela, Nevaeh, Natalie…all technically non-Biblical. 27%-73% is remarkably similar to both 25%-75% (smaller 2014 sample) and 30%-70% (1914 sample). So here’s the question of the day: If you had to choose all of your children’s names from either one group or the other — Biblical names or non-Biblical names — which group would you stick to, and why? Ever wonder what the top baby names in Yukon are? Me too, so I looked them up. Turns out the sparsely populated Canadian territory — which is next door to Alaska, larger than California, and home to only about 34,000 people — releases baby name lists that cover 5 years at a time. So let’s roll the four most recent lists (i.e., 20 years of popular names) into a single post, shall we? Madison and James from 2006 to 2010. 78.8% of the 586 girl names and 70.9% of the 478 boy names bestowed from 2001 to 2005 were used only once. 79.7% of the 601 girl names and 71.9% of the 559 boy names bestowed from 2006 to 2010 were used only once. Which girl names increased/decreased the most in popularity from 2012 to 2013? Below are two versions of each list. My version looks at raw number differences and takes all 19,114 girl names on the 2013 list into account. The SSA’s version looks at ranking differences and covers roughly the top 1,000 girl names. Check out Sadie! I wasn’t expecting to see that name here. Unlike Penelope, which I was expecting to see here. Harper, Aria, Charlotte — still going strong. And Paisley’s back, though the rise has slowed: 3rd in 2012, 18th in 2013. Does anyone have a theory on Jaylah? Newbie losers on the left-hand side include Sophia (still the #1 name despite the decrease), Lily, Hailey and Sophie.